BROWN MILLS, N.J. -- A Burlington County man has been charged with the murder after human remains were found in the Colliers Mills Wildlife Management Area last month. 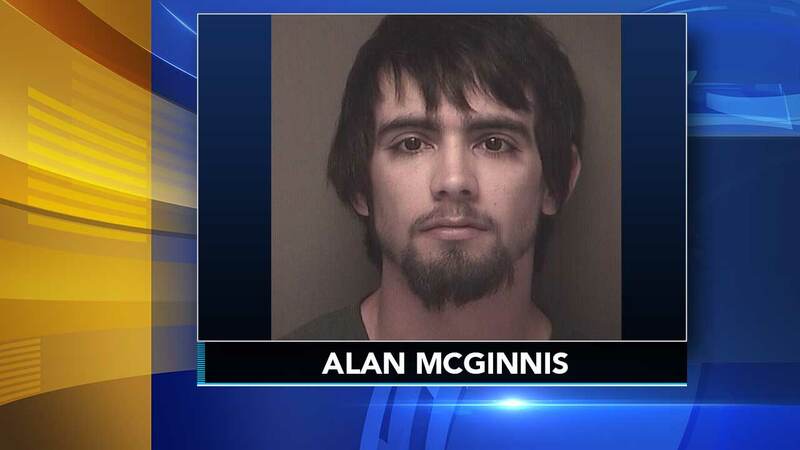 Alan McGinnis, 20, has been charged by the New Jersey State Police with murder, kidnapping, possession of a weapon for an unlawful purpose, unlawful possession of a weapon, improper disposal of human remains, and destruction of evidence. Cody MacPherson, 20, was reported missing on September 24, 2017. Pemberton Township police say he had recently moved to Brown Mills from Portage, Indiana. Police say a district warden was preparing for a controlled burn on March 19 when he discovered MacPherson's remains. According to investigators McGinnis, of Pemberton, allegedly stabbed MacPherson multiple times at a home on Pardee Boulevard. Investigators say McGinnis then put MacPherson's body into the trunk of a vehicle and drove to the Colliers Mills Wildlife Management Area. They say McGinnis later traveled back to Pemberton where the scene was cleaned of blood and other evidence of the murder. Approximately one week later, officials say the suspect returned to the site in which he disposed of the victim to destroy other evidence associated with the crime. McGinnis was charged on Saturday and is being held in the Ocean County jail.